Thousands of people are gearing up to have the time of their lives in the dessert of Indio, California for the infamous Coachella Music & Arts Festival. Well, better known this year as #BEYCHELLA. Didn’t quite have the coin or the crew to make pack up for the weekend & getcho’ life? No worries, me neither. But between Instagram & YouTube the only thing we’ll really be missing is a wristband. 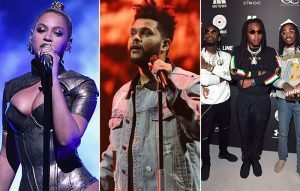 Beyoncé, The Weeknd, Migos, and others will have their sets broadcast live online during Weekend 1 of the three-day desert festival, which runs from April 13-15th. However, Eminem & Cardi B’s set to perform but not yet confirmed for the live stream. Among the 77 artists currently confirmed for the live stream are Post Malone, Vince Staples, 6LACK, Tyler, the Creator, French Montana, WizKid, Aminé, Belly, Chloe x Halle, Daniel Caesar, and DeJ Loaf. More names will be added leading up the festival. As of now, the T-Mobile-sponsored stream will only be available for the first Coachella weekend. Google is also a partner this year. No worries. We just tell everyone we went.